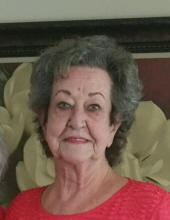 Jean Perry Potts, beloved wife, mother, sister and friend was surrounded by her family as she went to be with the Lord on Saturday, January 26, 2019. She is survived by her husband; Robert Grayson (RG) Potts, daughter; Shelby Johnson Wright of (Mechanicsville, VA), three sisters; Patsy Barrow (Gerald) (Sylvania, GA), Carolyn Perry (Richmond, VA), and Peggy Ikall (Joe) of (Chocowinity, NC). Jean was born in Beaufort County on April 16, 1939. Over the years she worked for many companies as a bookkeeper, secretary, etc. but may be best remembered as the co-owner and operator of Big John’s Sporting Goods. Wherever Jean worked or came in contact with people, she was open to being a caring listener and loving friend. Jean loved her Lord and her church family. She was a member of Calvary Baptist Church where she sang in the choir for as long as she physically could. The family will receive friends from 6:00 – 8:00 PM Wednesday evening at Reins-Sturdivant Funeral Home. Funeral services will be held 2:00 PM Thursday, January 31, 2019 at Calvary Baptist Church with Rev. Mark Hall and Rev. Jamie McGuire officiating. Burial will be in the church cemetery. Flowers will be accepted or memorials may be made to the charity of the Donor’s Choice. To send flowers or a remembrance gift to the family of Jean Perry Potts, please visit our Tribute Store. "Email Address" would like to share the life celebration of Jean Perry Potts. Click on the "link" to go to share a favorite memory or leave a condolence message for the family.